Anglers turned up in large numbers over the weekend and you could say most of the river was very busy. 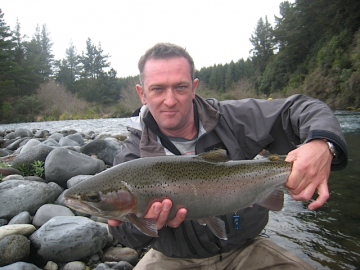 Angling pressure is high currently and it must be good for the quiet township of Turangi. Rivers which are close by are seeing anglers also especially those that are sick of the crowds and are seeking smaller quieter water. Rivers such as the Waimarino and Waiotaka are receiving pressure but I don’t think many fish are getting caught in these places as the water is so low and fish so spooky. I guided on Saturday morning with first time anglers and caught and lost some really solid trout in the lower river. The lower river is getting most of the pressure but it’s also spitting out most of the good trout. In amongst the silvers there are plenty of coloured up jacks-especially hanging in shallow riffles or spawning water. 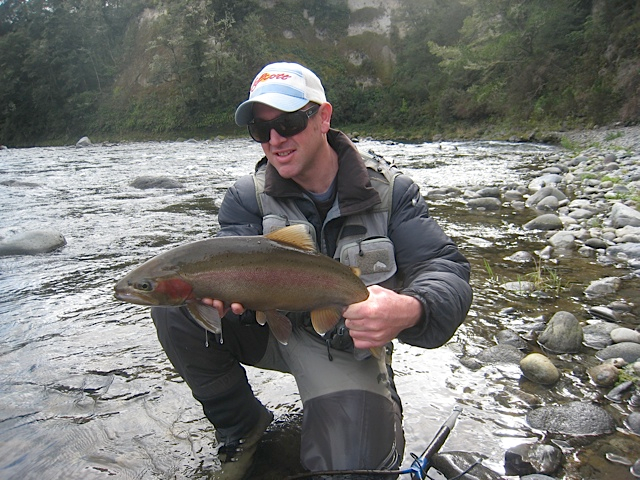 Trout are still eating naturals most of the day with only the odd fish taken on the famous glo bug. With so much nymph life in the river its very hard to use any other pattern. The season still continues to amaze some anglers as fish still trickle in most nights and are in catchable positions in the mornings. With heavy angling pressure most fish will be seeing an angler or two on it’s journey up river to spawning areas. We are due plenty of rain in the next few days which should push even more trout into the rivers, not that we need anymore. The weather man has not had a good run on predictions in the last few weeks so maybe we wont get any but I really hope we do. I have a good week ahead with clients that I have fished with before and I am looking forward to hooking into some good patches of fish like we have been finding, lower and upper river. It’s all good to getÂ a fish under the beltÂ and fish the lower river but it certainly is a lot nicer to be up in the Sand pool without many anglers. If anyone has landed any fantastic fish in the Tongariro over the past few weeks I would be keen to hear and see one as there have been a load of trout almost the same size-must be a big koura muncher in there somewhere. Have a good week guys.